When people debate over getting their “first bird” (I refuse to call any bird a “starter bird”, for each bird is its own individual and there will never be another quite like the one you adopt) most people question whether or not they should go for a cockatiel or a budgie (a.k.a. parakeet). This has been debated to death in very clinical ways (like here or here or you can even take a fun test to determine your “right” bird here!) but I can’t help but weigh in. I’d recommend a cockatiel every time. Budgies are gorgeous and come in so many fun colors that rainbows are frequently jealous, but their personality (at least, if you have more than one) pales in comparison to their lesser-hued cockatiel compatriots. Roosevelt and Beaudesert, our rainbow American budgies who flew over the rainbow bridge. Having owned five budgies in my relatively short life and having spent several years volunteering at a bird store, I feel like I am qualified to comment. While budgies are quite entertaining, playful, and curious little buggers, they fail to fully connect with their human care-givers, especially in the presence of other little birds. And we’d know–the baby budgies pictured to the left were hand-raised, spoiled-rotten little dudes that we visited literally every day up until they came home with us–even before they developed their pin-feathers, even! We showed up, petted and coddled and generally loved our baby budgies almost from the moment they each hatched–and yes, they were incredibly docile, happy to step up, groom our hair (and eyelashes, which is sort of weird), were generally not nippy, and were overall wonderful birds. However. In spite of being raised in separate cages and given ample one-on-one attention from both Hubby and myself, they still more tolerated us much moreso than wanted our company. Sure, we were interesting sources of entertainment for two or three minutes, but they were MUCH happier on one of their numerous playstands with each other throughout our house. An American and an English budgie–size comparison! …Also where they preferred to land when they’d randomly go spastically flying off. But if you want a calm pet who is very interested in a connection with you and won’t go flying off with the slightest brush of the breeze, go for a cockatiel. They crave companionship of all kinds–when we pull Qtip down with us, he’s genuinely curious. Many of the cockatiels we’ve known have been QUITE snuggly, especially any that were hand-raised. 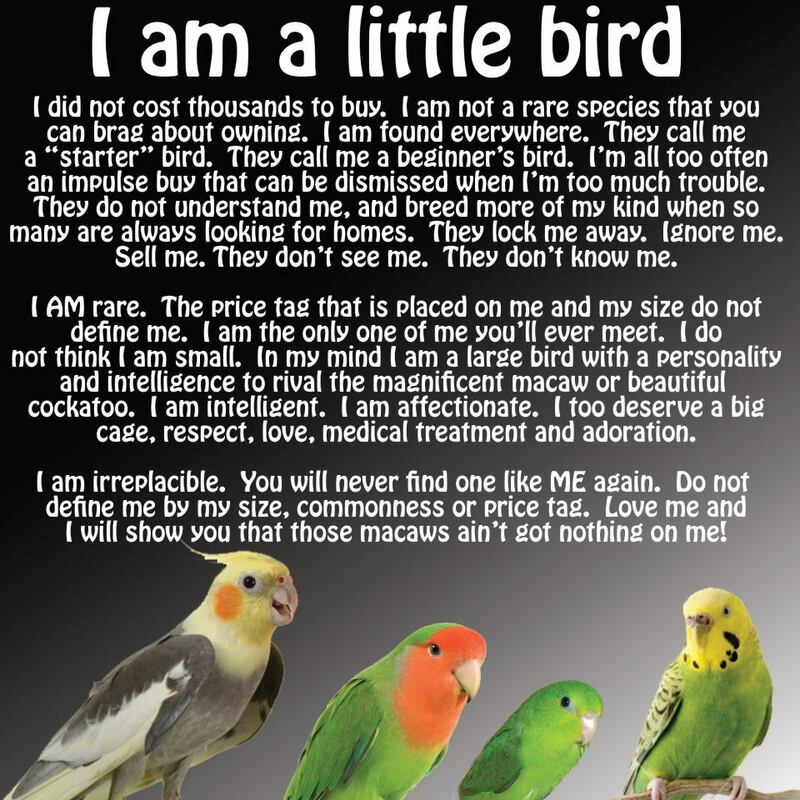 Some can be needy, so if you don’t want a bird with the same penchant for attention as a dog or a cat, sure, go the way of budgies… but if you really don’t want a hands-on bird, don’t get a parrot. Both cockatiels and parakeets really need time outside of the cage every day–if you want a bird merely to watch and keep you company, get several finches instead. Also, did I mention that cockatiels dance? And sing? Cockatiels are just so lively, curious, and full of personality with a drive and desire to connect with bird and people alike (especially if you keep your little dude in a cage separate from other birds). We’ve truly fallen in love with the species as a whole–they have all the BEST parts of the cockatoo family while forgoing the worsts. We went with budgies as our first birds because of their coloration and the dry pros/cons articles listed above; while I wouldn’t trade my current English budgie girl for anything, I still wonder what would have happened had we taken home a cockatiel.